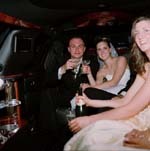 *Receive 10% OFF Limousine Package w/Tuxedo Rentals. Grooms Tuxedo is FREE with (4) other rentals. Our chauffeurs are courteous professionals and the quality of their services is unsurpassed. We are more than mere luxury!. Our chauffeurs assist with lining up your Bridal Party prior to the ceremony, making sure the Groomsmen have their flowers on, fixing crooked necklaces, handing out mints, supplying water during the receiving line and photo sessions and assisting the photographers with photo locations. Red Carpet Treatment is provided immediately upon our arrival and the carpet is rolled out every time you enter and exit the limousine. All reservations are on a First Come, First Serve basis upon receipt of the paid deposit. The Balance must be paid one week prior to the wedding date. Complimentary Champagne Toast is set up and waiting for you after the ceremony (21 and over only). JUST MARRIED sign is attached to the rear of the limousine following the ceremony. Ask about availability for transportation from the reception back to your home or hotel. Chauffeur's gratuity/tip of 20% is not included. Upon our arrival at your home you are treated with "More Than Mere Luxury" from the red carpet being rolled out prior to you entering and exiting the car and upon your arrival at the ceremony location to the chauffeur assisting you with your every need including fluffing your dress prior to walking down the aisle. Our chauffeurs assist with lining up the bridal party so you can relax and enjoy your surroundings. During your ceremony the chauffeur is busy setting up your Champagne Toast and putting the "Just Married" sign on the back of the limousine. After the ceremony, the chauffeur will be providing bottled water during your receiving line. The Champagne Toast will be ready for you and your bridal party to enjoy your first toast together as husband and wife as your family members and guests look on to share in the memory. The chauffeur will then take you to your photo location and assist you and the photographer with all your special photo memories. The chauffeur will also provide bottled water during your photo session. After the photo session we will drive you safely to your reception area so you may begin enjoying your wedding reception as husband and wife. If you're thinking "We don't need three hours because our wedding is all at one place", may we suggest transporting some of your guests to the ceremony, such as your grandparents, in-laws, and/or elderly guests requiring assistance. If the time allows this provides a special opportunity for them to enjoy possibly their first ride in a limousine. We offer a 10-14 passenger van to transport guests between reception and hotels! Call for pricing and availability. *RECEIVE 10% OFF WITH TUXEDO RENTALS. Prices include 3 hours of professional, courteous service by formally dressed chauffeurs, complimentary champagne, bottled water and red carpet treatment. Rates vary depending on pickup location, destination, time and number of passengers. Reservations should be made as soon as possible.